People very often confuse bees and wasps as they are both insects that give painful stings. However, they are quite different in many aspects, physical as well as behavioral. You are probably more likely to encounter a wasp as they are more aggressive and invasive by nature, yet we are prone to calling all the yellowish-black buzzing insects bees. This may actually ruin honey bees’ reputation and lead to people easily killing them, even though they are one of the most important insects we have. Of course, this does not mean you should mercilessly kill wasps, but just know that those boring, invasive animals are not bees; wasps do have a very important role in the ecosystem as well. Experts at Bee Busters tell us how to tell these insects apart. The truth is it is often difficult to pay attention to the physical appearance of that swooshing buzzing insect you are trying to get rid of. So you are not really putting too much effort into distinguishing its colors. But if you do look closer, you will easily recognize a wasp by the bright colors, very often a combination of yellow and black stripes and shiny, smooth skin. They have a thin waist and four wings. Bees, on the other hand, can be completely black, or with orange and yellow patterns. Most notably, bees are hairy and their skin is not completely smooth. So, next time, pay attention and you will easily recognize the intruder. As previously mentioned, wasps are far more aggressive than the bees. They are natural predators. If an insect comes to you unprovoked and starts pestering you, you can be sure it is a wasp even without paying closer attention to its appearance. This is because bees are naturally peaceful and will attack only when they are disturbed or feel in danger. Not only are they non-aggressive, but bees can even develop a close relationship with humans. So there is quite a difference. All you know is it hurts like hell and it was a bee. No, wait, a wasp. Anyway, you don’t care much what happens to the animal that stung you as you are occupied by your pain, but it might be useful to know that honey bee can only sting once – it dies immediately after that. Wasps, on the other hand, can sting all the want without any consequence. Well, unless you hit them with something, of course. Distinguishing between bees and wasps can be really important in case of stinging, as it can help decide the therapy if necessary. Some people may be allergic to a bee or a wasp sting as the venom which these insects produce can cause an anaphylactic shock. 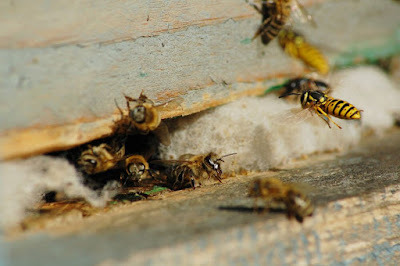 If you find a hive outside your house or building, it is mostly likely a wasp nest. Bee hives can usually be found in protected areas, like an inside of a hollow tree trunk or inside a wall. Also, you will recognize a wasp hive by its umbrella shape with hexagonal cells. It is usually an open nest which is likely to host around 100 wasps. If you see a nest built of a waxy substance, you have most likely encountered a bee one. Wasps and bees are quite similar in many ways, but our interaction with them can be dramatically different, especially since we tend to think we only have benefits from bees and not from wasps. Be it as it may, you should pay attention and distinguish between these two types of insects which do belong to the same order of Hymenoptera but differ in some many aspects, you never know when it might get handy.